Heat oven to 350°F. Spray 8 (10-oz) ramekins or custard cups with cooking spray. Place ramekins on large cookie sheet with sides. In 12-inch nonstick skillet, melt 2 tablespoons of the butter over medium-high heat. Add chicken; cook about 10 minutes, stirring occasionally, until no longer pink in center. Remove chicken from skillet; discard chicken juices. Melt remaining 2 tablespoons butter in skillet. Add onions and mushrooms; cook and stir about 8 minutes or until golden brown. Sprinkle flour over vegetables. Cook and stir 1 minute. Stir in water, sherry and soup mix; heat to boiling. Boil about 3 minutes, stirring occasionally, until slightly thickened. Spoon chicken into ramekins (about 1/2 cup each). Spoon onion mixture over chicken (about 2/3 cup each). Sprinkle with pepper. Separate dough into 8 biscuits. Place 1 biscuit in each ramekin. Bake about 20 minutes or until biscuits are golden. Carefully remove from oven. 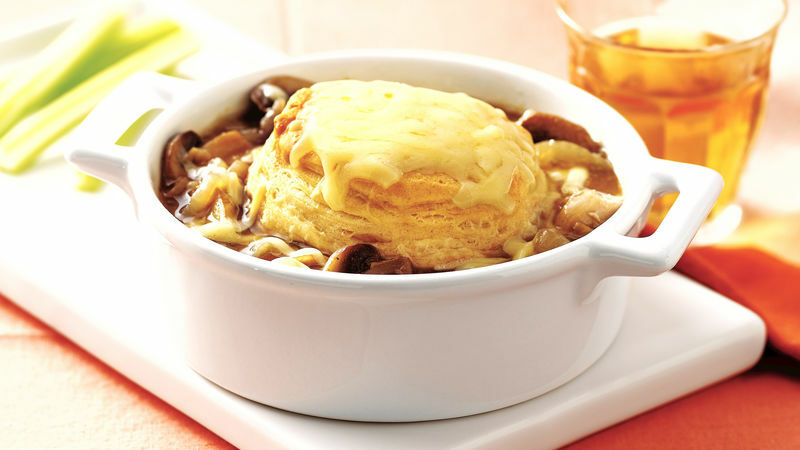 Sprinkle 3 tablespoons cheese over each biscuit. Bake 4 to 5 minutes longer or until cheese is melted. A large cookie sheet measuring 17 1/2x13 1/2 inches is large enough to hold all of the ramekins.